In 2017, Isabelle Moses decided to uproot her life. Having spent nearly two decades in Washington, D.C., she moved to Detroit in hopes of answering her soul’s call for something more and an opportunity to use her talents to be of service to others. “Detroit is a study of contrasts: high poverty and high wealth; gleaming skyscrapers and abandoned neighborhoods,” said Isabelle. “The Black Detroiters and allies who kept the city’s heartbeat pulsing vibrantly through the economic downturn are, in my opinion, winning the fight to retain the city’s soul.” Now having resided in the city for over a year, she took a few moments to share about the lessons she has learned about ancestry, freedom, and belonging. Honoring indigenous people and practicing decolonization: Detroit sits on the land of the Anishinaabe people, and in justice spaces, facilitators routinely take a few minutes to acknowledge that we are on their land. I feel challenged to think about the ways I’ve been both a victim of and a perpetrator of colonization. I continue to think about how I can interrupt the effects of colonization knowing that this is a multi-generational struggle. For example, I make an effort to support small-scale entrepreneurs, and POC-owned businesses in Detroit to foster greater self-determination and community-building. Knowing ancestry and lineage: Since moving to Detroit, I’ve been inspired to reconnect with more of my lineage and have learned to claim all of my ancestors – including the white slaveholders who played a part in creating my family tree. I honor that there is complexity in my identity as a Black woman. I’m also seeking to reconnect with family members I’ve been estranged from for decades and am making slow progress. The more I know where I come from and how I got to be who I am, the more I can call upon the insights from my ancestors whose intentions I carry forward in my own life. Learning the distinction between freedom and independence: For a long time, I’ve conflated independence with freedom and subscribed to the belief that I am the only person I can count on to make sure my basic needs are met. And while I have achieved a level of basic security, I also built invisible walls that prevented me from building deeper and more interdependent relationships. I’m learning that independence has been a largely solitary pursuit while freedom feels like a collective pursuit. I haven’t figured this out yet, but the more I root in Detroit, and the more I become enmeshed in community, the freer I feel to fail and the more I want to be a part of others’ support systems. Finding the intersection of uniqueness and belonging: It’s taken me 40 years to get really clear about who I am and to embrace my full self unapologetically. This means accepting a lot of contradictions that continue to reside within me. For instance, I love travel and exploring the world, but I also want to be a good steward of Mother Earth and know how harmful it is to the environment to fly excessively. Detroit has challenged me to just be me – and loving myself deeply creates ripple effects as I deepen my love for every community I’m a part of. I’m enjoying the journey and appreciating that the journey is the destination. Building a healing practice for self and community transformation: Perhaps the most life-changing aspect of Detroit is being in community with a beautiful array of people who model making self and community healing an ongoing practice. Check out Healing By Choice to learn more about community healing efforts led by gifted women of color in Detroit. Through their efforts, healing arts including Reiki, acupressure, and herbal medicines are made accessible to all. Celebrating Afro-Futurism: One of the things I love most about Detroit is that on the best days, it feels like I’m living in the future – where we have what we need to thrive, because we are able to count on each other. There is so much love by and for Black people in this city and it manifests in so many different ways. 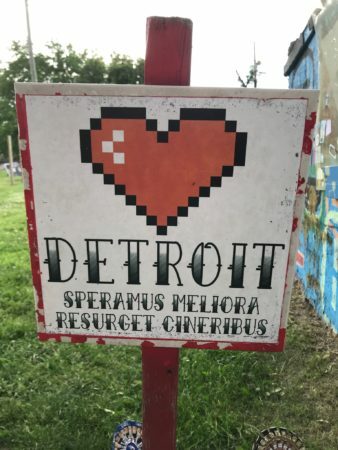 Detroit serves as a platform for a range of efforts promoting cooperative economics and racial justice in just about any domain you can think of and a lot of them are paving the path towards a more sustainable and equitable future. Isabelle Moses is the Director of Talent Development for Faith In Action.